The worker process for application pool 'APPLICATION_POOL_NAME' encountered an error 'Cannot read configuration file ' trying to read configuration data from file '\\?\<EMPTY>', line number '0'. The data field contains the error code. 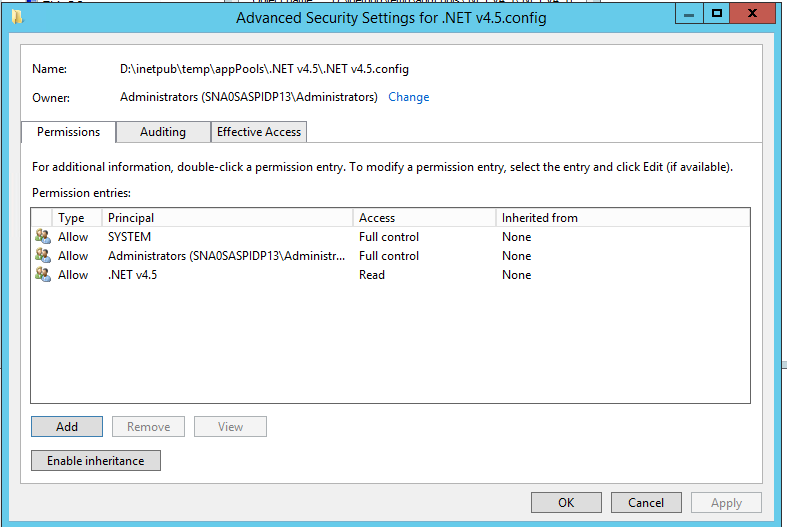 IIS is unable to read the application pool configuration file. This can be due to incorrect permissions or file system corruption. Right click the existing APPLICATION_POOL_NAME | Basic Settings... and take a screenshot of the settings. Right click the new application pool | Advanced settings and ensure all the settings match those recorded in step 4 then click OK.
For each application, Right Click | Change Application Pool... then choose your newly created application pool from the drop down list and click OK. Repeat for all applications assigned to the old application pool. Test the realms, they should now work.